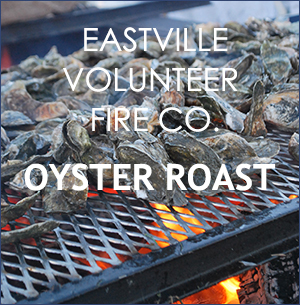 Come join us for the Eastville Volunteer Fire Company’s annual oyster roast! Oysters, clams, clam chowder, pulled pork, cole slaw, and more. Gatherings in fire halls are a long standing tradition on Virginia’s Eastern Shore and this one is sure to be a good time. There will be roasted oysters, steamed clams, oysters on the half shell, pulled pork and all the fixings. 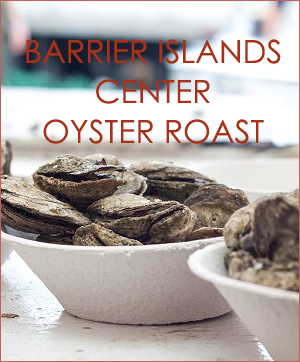 February may seem like a chilly time to hold an oyster roast, but the Barrier Islands Center pulls out all the stops to keep guests warm and toasty during their annual shindig. 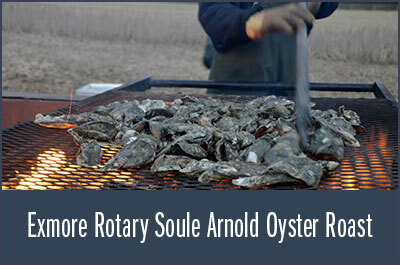 Visitors can dine on roasted oysters, clams, pork barbecue, grilled chicken and sides in the comfort of a heated tent. There are few places on the Eastern Shore that feel closer to the sea than Wachapreague, so breathe in the salty air and savor views of the Wachapreague harbor while you crack open freshly roasted oysters. There is plenty of fork-tender pulled pork, too, with classic sides like baked beans, potato salad and coleslaw to complete the feast. Beer and local Chatham Vineyards wine will be available and the Island House’s bar is stocked with cocktails. The event features a silent and live auction, as well as live entertainment. 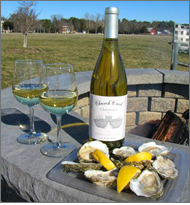 A special Virginia Wine & Brine event under the pavilion at Blue Crab Bay Co. This late morning, early afternoon brunch/lunch Virginia Wine & Brine event is under the pavilion at Virginia’s Eastern Shore’s famous gourmet grocer Blue Crab Bay Co. and features Chatham Vineyards wines. 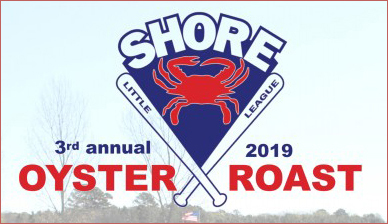 The Shore Bites Food Truck from The Island House Restaurant will be there serving fried oysters, grilled shrimp tacos, oyster & clam chowder. All items $5. Live music. Giveaways every hour! Get your holiday shopping knocked out with our great shop specials! Free admission. Enjoy half a dozen fresh shucked-oysters and a glass of wine for $15. Condiments will include a mignonette, cocktail sauce, and fresh lemons. Your choice of Church Creek wine by the glass. 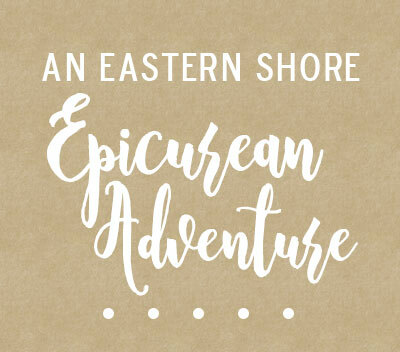 Join us at the winery for An Eastern Shore Epicurean Adventure with Guest Chefs Amy Brandt and Ross Riddle. Amy and Ross will prepare a 4-course meal highlighting the Shore’s distinct foodways, with an emphasis on seafood. Wine pairings will include a surprise or two from Chatham’s wine library. 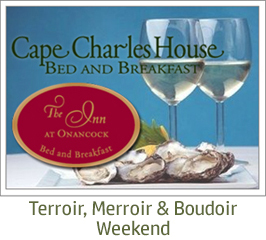 $100 per person* LIMITED TO 40 PERSONS RESERVE ONLINE or call 757-678-5588 *This includes the Merroir-Terroir Oyster Extravaganza if you wish to stay with us for that event to begin at 4 pm. 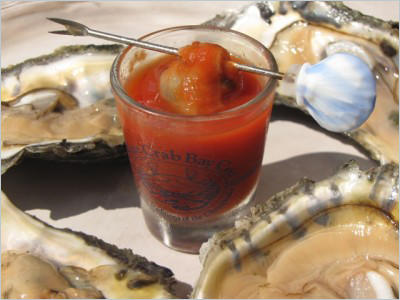 Join us at Old Donation Episcopal Church in Virginia Beach for their 81st Annual Oyster Roast & Fall Festival! 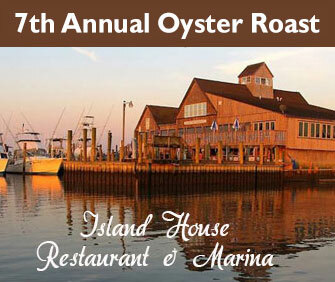 For more information and to purchase Oyster Tasting Tickets: call 757-497-0563 or email oysterroast@olddonation.org. Lunch served from 11 AM – 2 PM includes: Roasted and Raw Oysters, ODEC Award-winning Barbecue, and Brunswick Stew Chuck Macin of Uncle Chuck’s Seafood will conduct an Eastern Shore Oyster Tasting paired with Chardonnay from Chatham Vineyards and Foggy Ridge Cider. Three seatings for 40 at 10:30 AM, 12 and 1:30 PM. 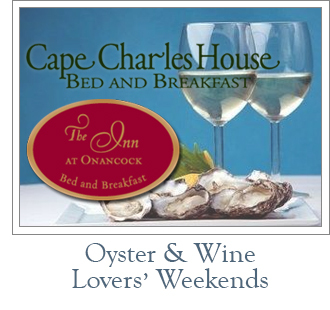 $40 per person includes: 13 oysters, wine and cider, a commemorative glass and an oyster ornament. Silent Auction of themed baskets and excursions on the ODEC bus including a wine tasting and lunch for 12 at Chatham Vineyards. Holiday Baked Goods and a variety of preserved products including ODEC pickles, watermelon rind, dilly beans and corn relish. Activities for Children including: Face Painting, Games, Photos with Santa White Elephant Sale Used Book Sale Historic interpreters conduct tours of the historic church Proceeds Support: Community Outreach Ministry Transportation from Westminister Canterbury: Call for pick-up times for the Old Do Bus About Old Donation Episcopal Church: Old Donation Church has a rich, long history, beginning in the Colonial period with prayers held in Adam Thorowgood’s parlor before 1637, with some histories reporting this occurring as early as 1635. Old Donation is Virginia Beach’s first church, being formally organized as the Lynnhaven Parish Church (Anglican – Church of England). The church building is on the National Register of Historic Places and the congregation has over 900 members representing individuals and experiences from all over the globe involved in a multitude of programs for people of all ages. Old Donation Episcopal Day School, winner of the Lynnhaven Now School Pearl Award, accepts children ages 2-4 for preschool and also Kindergarten. 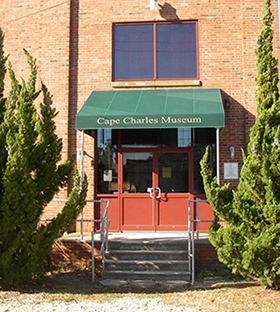 Cape Charles Historical Society will hold its 17th Annual Oyster Roast on Saturday, November 29 from 5 pm to 9 pm at the Cape Charles Museum. The menu includes local oysters – roasted and raw, fried chicken, potato salad, chowder, 3 bean salad, homemade rolls, desserts, coffee, and soda, with beer and wine available. 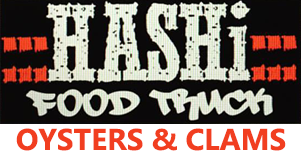 Food is served 5 pm to 7 pm, and there will be live music throughout. 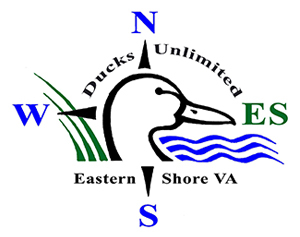 There will also be a silent auction featuring an array of eclectic items, and the traditional Eastern Shore 50/50 raffle. Seating is available both inside and out. Bring your dancing shoes — the Waterfront Band will be playing. $35 adults and $10 for children ages 7-12. Tickets available at the Museum (757-331-1008) and at Sullivan’s Office Supply, 109 Mason Avenue, by cash or check, or by emailing ccmuseum@hughes.net – let us know how many tickets you wish to purchase and you will receive and email invoice by Paypal. Sponsors are also most welcome – email for more information. The annual Ducks Unlimited Oyster Roast helps to preserve the very waters that provide the oysters that are the center piece of this feast. Held on the property of the Barrier Island Center, an historic almshouse, you feast on smoky, roasted oysters, juicy pork barbecue, baked beans, potato salad, coleslaw and assorted desserts. Festival goers can unleash their competitive side with both a silent and live auction. An annual Oyster Extravaganza! 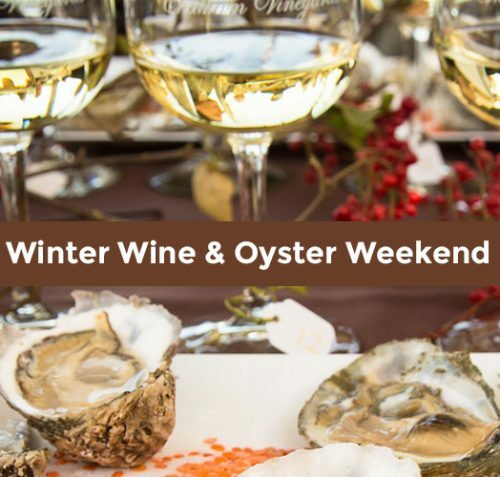 Partake in a tasting of Chardonnay from Chatham Vineyards on Church Creek along with heirloom oysters from the surrounding waterways… oysters cultivated as carefully as the vines are tended to express terroir to its fullest potential. TICKETS: $45/adults and $15/children (12 and under) | Advanced Reservations Required. Purchase tickets online or call 757-978-5588. 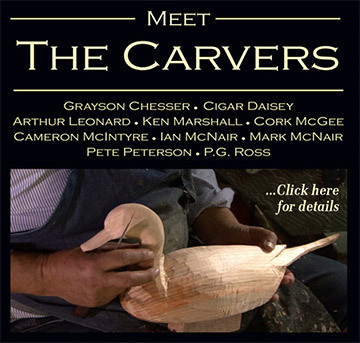 The Barrier Islands Center is honored to present an opportunity to meet and mingle with renowned decoy carvers Grayson Chesser, Cigar Daisey, Arthur Leonard, Ken Marshall, Cork McGhee, Cameron McIntyre, Ian McNair, Mark McNair, Pete Peterson, and P.G. Ross. Come join us for a reception, exhibit, and casual conversations with Virginia’s finest carvers. These talented artists will have a range of their wok on display and will also have several pieces for sale. Guests will enjoy wines from Chatham Vineyards, oysters and have the chance to mingle and meet the artists. Tickets are $20 per person and tickets are limited. For more information, please visit the event website. Enjoy an Al Fresco Dinner on the grounds of the Historic Mimosa Farm, featuring locally sourced and sustainably grown cuisine, prepared by Chef Amy Brandt. 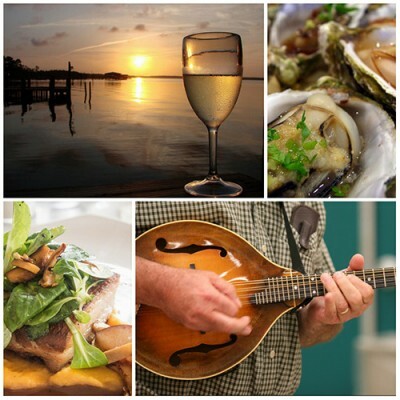 Celebrate the Bounty of the Bay, meet your local farmers, learn about their Bay-friendly farming practices, eat, drink, and tap your toes to a live performance by the Chairplace Players Bluegrass band. Mimosa Farm is beautifully situated on Eyre Hall Creek near Cheriton, VA. 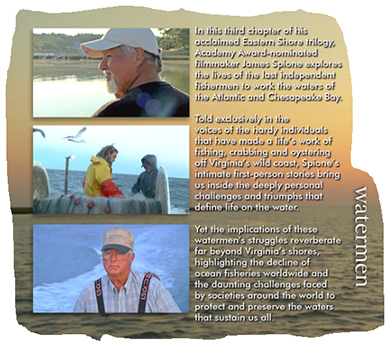 Beyond the delicious local fare of oysters, fish, and vegetables, The property offers more than 1,500 feet of waterfront access, and is home to osprey, bald eagles, and herons, a critical reminder of the necessity of clean water and a thriving Chesapeake. $45/person | Menu, Details and Registration Contact Tatum Ford at 757-971-0366 for additional information. There are few places on the Eastern Shore that feel closer to the sea than Wachapreague. 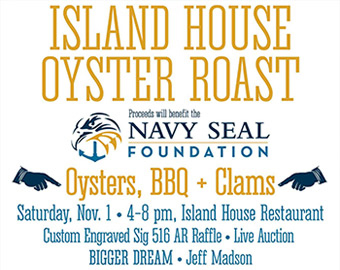 Attendees at the Island House Oyster Roast can enjoy breathing in the salty air, while taking in views of Wachapreague harbor and cracking open freshly roasted oysters; which have been cooked slowly over open fires. Diners can also enjoy freshly steamed clams. There will be plenty of fork tender pulled pork, with classic sides like baked beans, potato salad and coleslaw to complete the meal. Beer and wine will be available and the Island House’s bar will be stocked to provide cocktails. The event will feature a silent and live auction, as well as live entertainment. In addition to fostering good times the event also raises money for a good cause, proceeds from the event benefit Navy SEAL Foundation, which provides support to members of the U.S. special forces and their families .